About a year ago, I came up with a recipe for copycat KIND bars. 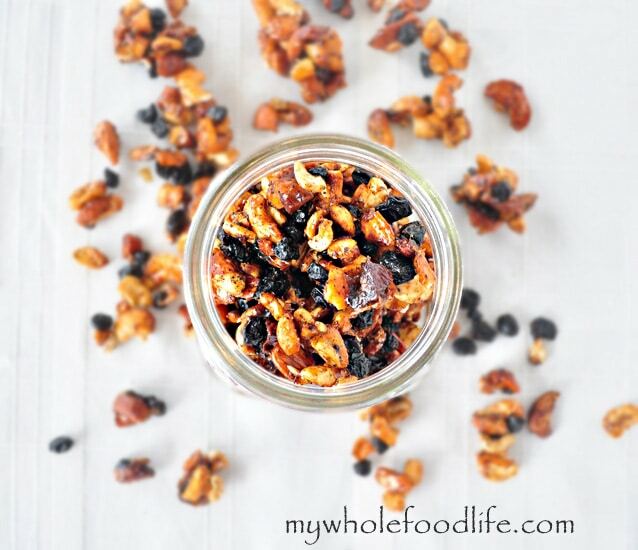 The KIND bar recipe that I created was modeled after the trail mix brand. It’s been on my mind to create another KIND bar recipe ever since. So the other day I attempted another. This one was for the Blueberry Vanilla Cashew flavor. Well mine didn’t exactly hold together well, but the flavor was AMAZING so I had to share it in the form of trail mix. I spent my entire 20’s hiking and backpacking all over the country. I used to swear that trail mix was what kept me going. However, back then, my idea of trail mix was Cheerios, peanuts, M&Ms and raisins. Live and learn right? I wish I had this trail mix on hand back then! Even though my KIND bar recipe was a fail, I think I know what I did wrong and I have plans to create another in the very near future. In the meantime, I hope you enjoy this recipe. Spread the mixture onto a lined baking sheet . That sounds wonderful! I would love this for breakfast or a snack! Love all the ingredients, and love the crunch! Yum! Was thinking of substituting dried cherries for the blueberries. Would that work? Again thanks for your great recipes and tips. Family is slowly going gluten free. How is the carb count on this ? Not sure the carb count, but the dried fruit and honey probably make it slightly high. Dried cherries would be fine. Dried blueberries were $20.00 a pound so I could not get even a cup. :( Any ideas of something that isn't dried? I love that you share all of your recipes with us. Thank you so so much!! Wow. That seems pretty pricey! I bet it would still be good with some raisins or dates. Or I bet shredded coconut would be good in place of the blueberries. Thanks so much! That was at Whole Foods which is generally cheaper than our other local grocery stores. :( We are out of raisins at the moment so I will try shredded coconut. Thanks again! Hi! This sounds great! Is there a replacement for the dates? That isn't staple in my pantry but I would love to try this out! Thank you! You can probably sub raisins and apricots. 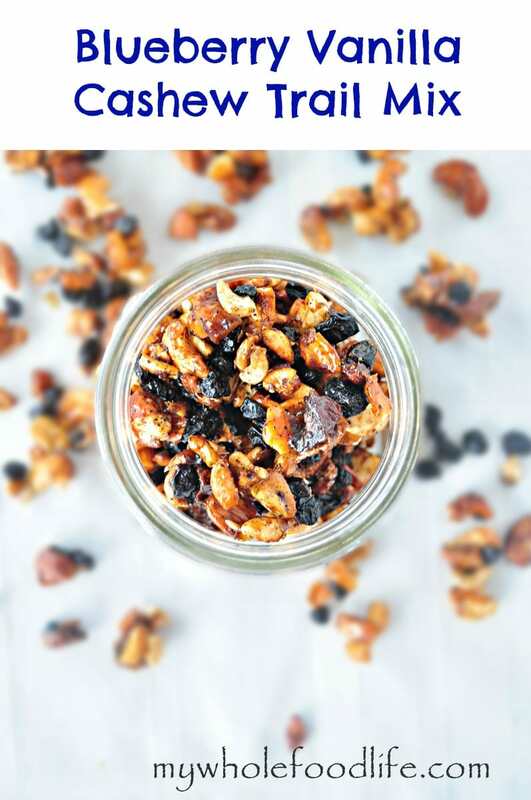 This sounded so delicious and I was looking for a new granola recipe! It went from very syrupy to burnt at 21 minutes. The few pieces that weren't burnt had a good flavor. 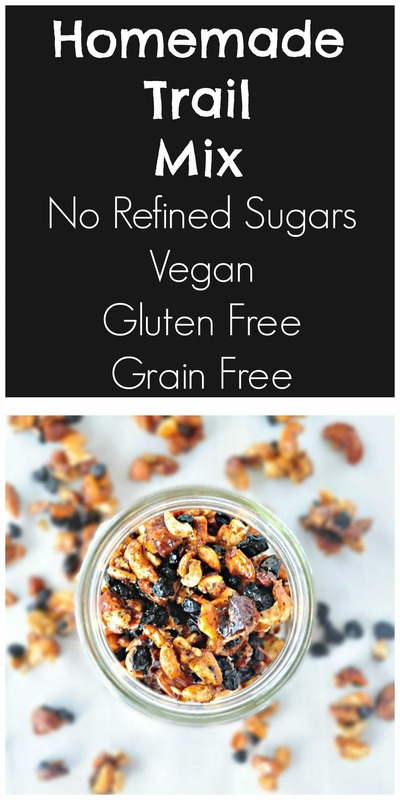 At the cost of the ingredients for this one I will stick with my tried and true granola recipe. I just made this today and it is so good!! I did add some oatmeal, pepitas and some hemp seeds in addition just because I like them and only used 3/4 of a cup if cashews. The flavor was delicious!! My husband really liked it and he's picky. Thanks for the recipe!! You are so welcome Kayla! Glad you liked it! I was thinking of making this for my daughter who is a vegan, but I didn't think vegans ate honey? Honey is a gray area for some vegans. You can always make this with maple syrup if you want to avoid the honey. I made this yesterday and it burned. I lined my pan with parchment paper and was careful to stir it every ten minutes. I used a pizza pan that had raised edges. I thought about trying again on an airbake cookie sheet but other than that, I don't understand why it burned. I doubt it's my oven because I don't have trouble with other things burning. Any ideas? I'm sorry that happened. :( I have no idea why. All the dried blueberries I see in the grocery stores have added sugar. Where do you purchase yours?